Doreen and I are celebrating our 55 years of marriage (a little early) at the 24th Family Reunion in Italy. We have rented a refurbished farmhouse in Tuscany, Villa Prato al Sole, in the village of San Pancrazio near Monte San Savino. So far the 15 family members (Lior is in the army and couldn't join us) are having a great time. More next week. Our Reunion is primarily for the family to have fun together and bond (and eat! ), but we also have, so far, visited Orvieto, Perugia, Pisa and San Gimignano. Next week - pictures and report. Daughter Vered Ron, after 9 years of working with Benny Landa, started a new job this week. She joined Taboola, an internet marketing company, as VP & GM Taboola News. We all her wish her good luck and success in her new job. Ilai enjoyed taking part in the national Junior Cyber contest in Holon.. Unfortunately spectators were not allowed, so we have to make do with this impressive picture of the participants. After their success in the regional Robotics Championships, Itamar's school took part in the National Contest, held this time in Tel Aviv. They all thoroughly enjoyed the experience. We attended a few hours of the competition and were amazed not only at the technological achievements we saw but also at the unbridled enthusiasm of the contestants and the good natured rivalry. See pictures here. In a few days time we (the whole family except Lior who is in the army) will go Italy for a week's Family Reunion in a refurbished farmhouse in Tuscany near Florence. The day before we leave, we will put our votes in the ballot box hoping to help replace the Netanyahu government with a democratic and peace-seeking alternative. 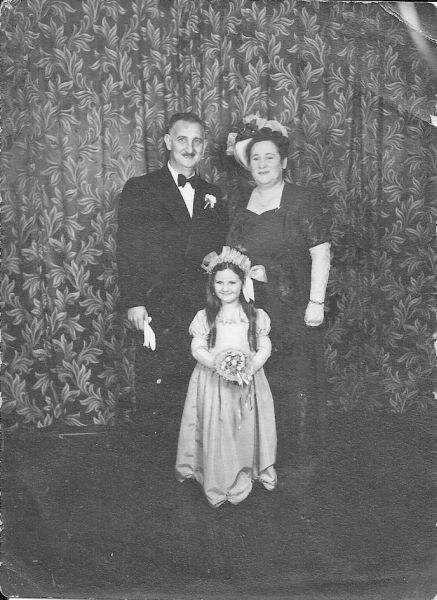 To the best of my recollection this picture of my parents and Fern as a flower girl was taken at the wedding of my father's cousin Louis Hurwitz to Avie Woolfson in Durban in 1948. (see Matz family tree). Granddaughter Ilai Levy and 3 others from her school will be attending the 2019 Israel Cyber Competition. (see picture) in a few days time. We hope to be present at part of the competition. With winter finishing and warmer days coming, it's time to start barbecuing. See Doreen's recipe for delicious barbecued wings. This last week we were in Lausanne, Switzerland for six days. 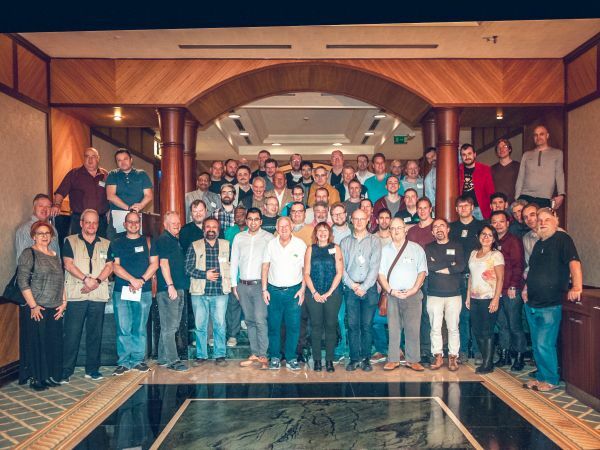 I attended a two-day meeting of the European Bridge League Executive Committee. We stayed with our wonderful friends Pierre and Francois Collaros who entertained and fed us royally, and also lent us their car. We have visited Lausanne and district a number of times, but always enjoy seeing new places and some of the old places again. Click for some pictures here. While we were in Lausanne, our grandchildren were enjoying dressing up for the festval of Purm. We're sorry we couldn't see them, but from the photos we received it seems like they had a great time. Granddaughter Lior Ron has finished her basic and special training in the army (see last week) and she has two stripes to show for it. 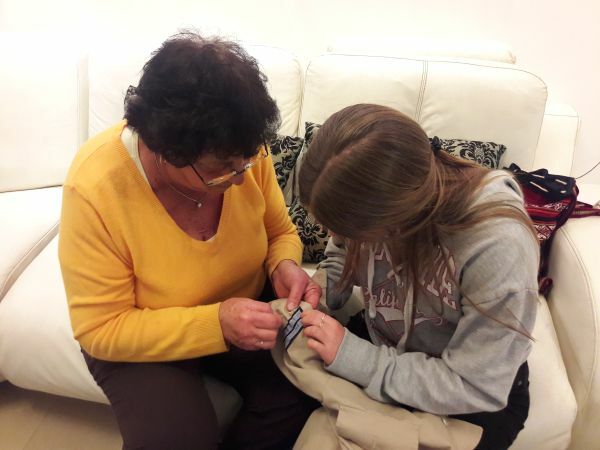 Corporal Lior enlisted Granny Doreen to help sew her insignia on her uniform. Congratulations to granddaughter Ilai Levy who has been chosen to be one of four pupils to represent her school in a national Computer Cyber Contest, to be held in 10 days time, in a competition testing logic. Tomorrow we fly to Lausanne, where I will be attending some bridge meetings. Doreen is accompanying me and we will stay and spend a few extra days with good friends Pierre and Francoise Collaros. Every March the European Bridge Executive holds meetings in Lausanne at the International Sports Center. Spending a few extra days with the Collaros's has become a lovely tradition. See here for example..
Grandson Itamar took part in the FRC Robotic Championship held this past week in Haifa. Participating schools are given a task to be performed by a robot, and the students have 70 days to plan and build a suitable robot. This year the task was to build a robot that could pick up a ball, move to the "goal" area and shoot the ball into a tunnel whose rear end had been previously blocked by the robot to prevent the ball coming out of the tunnel. In addition, there were 3 robots on the field, and a robot could block another robot from scoring. After scoring the robot had to climb on a dias or platform (different heights of the dias earned different points). 92 schools took part, and Itamar's robotic class were placed 10th and reached the quarter finals. 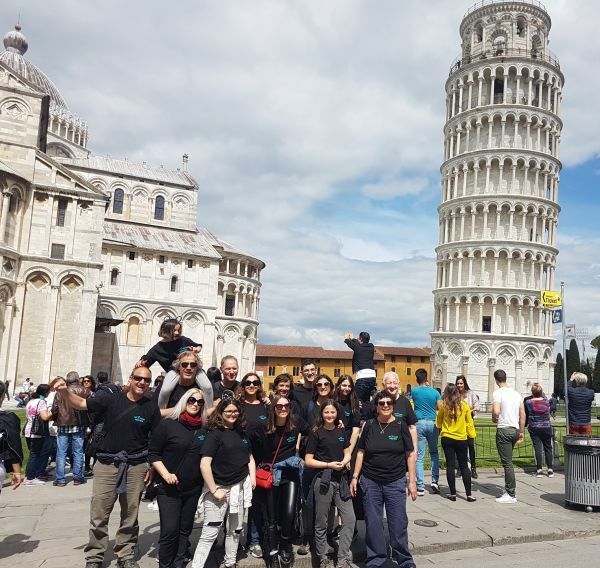 Itamar reports that this was a fantastic experience. 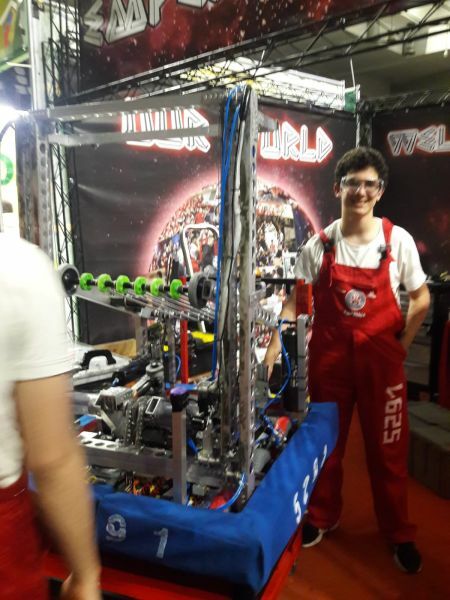 The combination of planning and building the robot, then taking part, and meeting other people who all had a common interest and a passion for robots and success was amazing- as he puts it "we were all on an extended high the whole time." We're very proud of you, Itamar. This was a terrific achievement and we congratulate you on the result and on the experience. As reported last week, granddaughter Lior Ron finished her unit training in the Army. But then there was a surprise. She was chosen as the Outstanding Trainee of the course. Click for a photo of Lior with her certificate. Well done, Corporal Lior! Our grandchildren seem to be growing older very quickly! Suddenly (or so it seems) our second youngest granddaughter, Ilai Levy, is accepted into the high school she wanted and we realise that she is not so young any more. Picture here. We received a video of grandchildren Lotem and Zoe Segoli performing the Ross and Monica dance from Friends. Click to see. 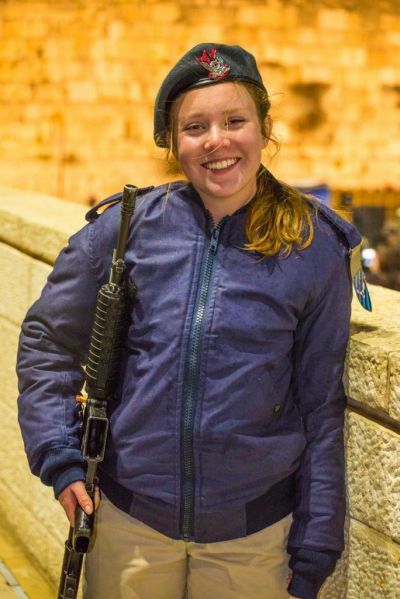 Granddaughter Lior Ron has finished her Basic Training and is now a regular soldier in the Israel army, assigned to a unit. Her parents Aviv and Vered and sister Danielle attended the Swearing-In Ceremony and were very moved. We congratulate Lior on getting through the hard basic and specialised courses . Maayan and Lotem enjoyed three more days in Lisbon with us and returned to Israel last Tuesday. We got back early this morning. Doreen and I enjoyed Lisbon, even though I didn't see too much of it, and it brought back many happy memories of our trip to Potugal two years ago. Click for pictures of the first two days in Lisbon, and here for the last few days. Granddaughter Danielle is back in Israel after her work (and holiday?) in Hawaii. See picture. She was especially happy to return in time to be at sister Lior's ceremony. We're in Lisbon - see This Week's News below. Doreen took the grandchildren to Boca do Roca, the westernmost point of Europe. It was fun thinking there was nothing between them and the Americas except the Atlantic Ocean. As can be seen from the picture above, we're in Lisbon, Portugal. Doreen and the grandchildren have accompanied me here where I am officiating at the European Mixed Teams Bridge Championships. They unwisely went to the opening of the bullfighting season. They left before they could take any pictures. Click here for pictures of the first two days in Lisbon. 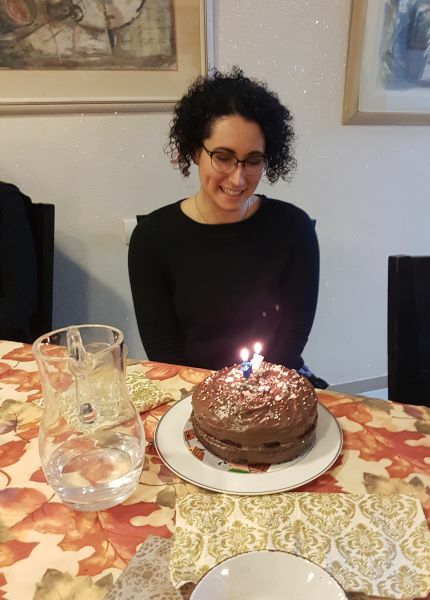 We were delighted to hear some months ago from Devra Hock, a relative on the Nochomovitz side, who would be in Israel to attend a meeting of a Museum Research Group as part of her studies for a Ph.D in paleontology. 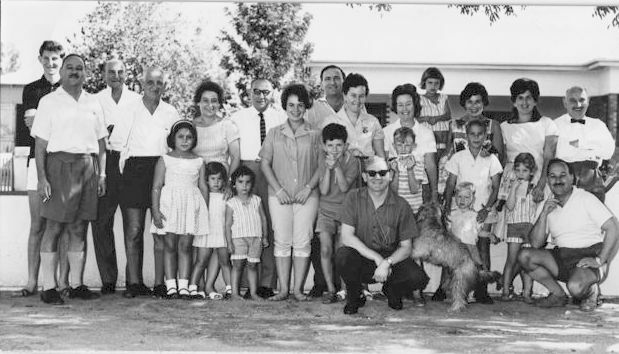 We have never met her or her parents but have met quite a few other Hock relatives (for example, see here.) . Over the weekend we got to know her as friendly and articulate. Her visit culminated in a Friday night family dinner, before her flight back home to the States. As it turned out, the timimg was excellent, as we could also celebrate her birthday! Doreen baked a delicious chocolate cake (vegan of course for our granddaughters) seen in the picture above. You can see the recipe here. Click for some pictures of the family dinner. We're back in Israel after visit to Antalya, Turkey for the bridge course, and preparing for next week when we visit Lisbon, Portugal where I shall officiate in the Mixed Teams European Championships. We have a busy period between our trips - doctors's appointments, tax arrangements, garden upkeep, a couple of bridge commitments and lots of odds and ends around the house. 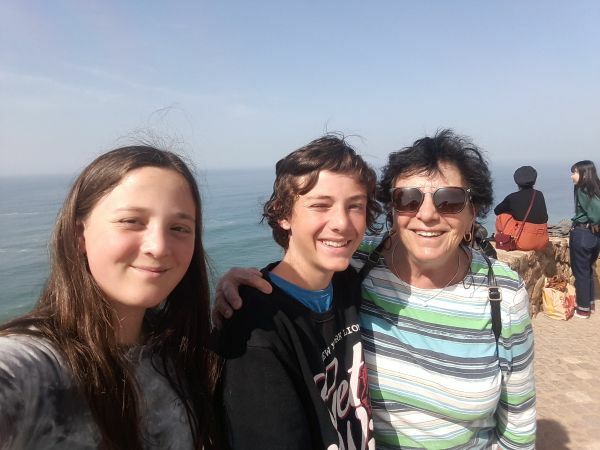 We will be taking two grandchildren, Maayan and Lotem Segoli, with us to Lisbon, and Doreen will show them around while I am busy. We thoroughly enjoyed our visit to Portugal just over two years ago. Doreen is looking forward to the visit. and is busy preparing an itinerary for them. Click for a picture of the Tutors grading Entry test papers. I was busy during the time in Antalya and only managed to see a little of the city during the last afternoon, but Doreen had time to get around and see some more of the area. Click for some pictures. We received a lovely picture of our eldest granddaughter Dani in Hawai. After last week's family supper the Eilat Levys went on a short visit up North to the Golan and granddaughter Ilai took some pictures. See one of them here. 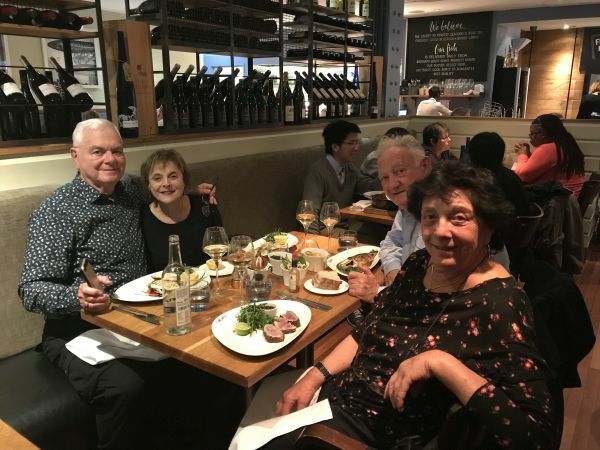 Two days separate granddaughter Ilai's birthday (28 Jan) from son Moran's (30 Jan) and Doreen decided to invite the whole clan for Friday night dinner last night. 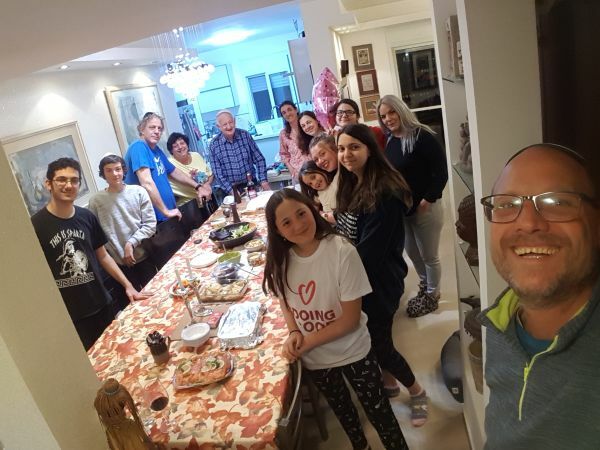 14 of the 16 (both AvivR and Dani are overseas) came from Herzliya, Sde Boqer and Eilat and enjoyed being togethert and a really exceptional 5 course dinner cooked over 3 days by Doreen. Click for more pictures here and on Ilai's page. For the family dinner Doreen prepared varied appetizers: braised fennel, polenta cups with mushroom or avocado or shrimp filling, gravlax and roasted beetroot, and of course delicious home-baked baguette. The gravlax was excellent and she has added the recipe to the Recipe page. See the recipe here. On Monday we fly to Antalya in Turkey for 6 days. I am organising an International Tournament Directors' Course there, with participants from 25 countries. 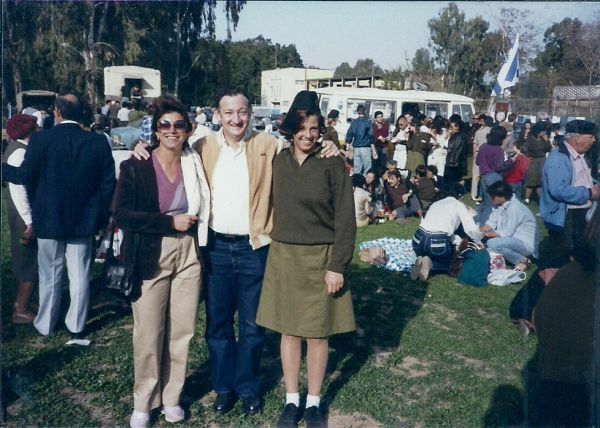 Now that granddaughter Lior Ron is doing her compulsory army service, (see for example her enlistment), I thought she might like to see her mother when she was in the army. From my collection of "Old Photos"
We've had some medical ups and downs these last weeks and now we're more-or-less back to normal. Despite this, we had friends over for dinner a couple of times, and as usual, Doreen prepared delicious and innovative dishes. One of the dishes she prepared was braised fennel - you can read her recipe here. Moran has posted part B of the Segoli visit to Madagascar with some fabulous pictures, read in Hebrew and in English. It's school end of term, time for report cards,and so far they have been excellent. We are proud of all of you. I recently received this picture from cousin Sharon Leibowitz. 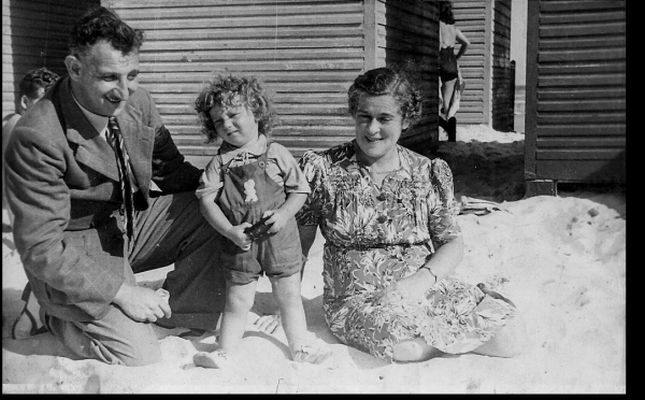 It was taken in Upington at the bar mitzvah of Charles, son of Eric Levy and Winnie (nee Edelstein). Members of both families are present, but surprisingly Charles is apparenty not in the picture! We continued to enjoy London, its food and shopping. We had a most interesting visit to Bletchley Park near Milton Keynes where Alan Turing worked during the 2nd World War to decipher the German Enigma codes. We were amazed not only what he and his colleagues achieved but that over 10,000 men and women were involved at Bletchley. It remained a secret until the mid 1970's; today with mobile phones that would be impossible. We had lunch with long-time friend Shirley Poluck, whom we met when we first came to ulpan in 1965. We returned to Israel on Tuesday. Last night we had dinner at the home of daughter Vered and Aviv, and were happy to again meet newly weds Jonathan and Alexandra, and Nadav Keyson, sons of Jose and David Keyson and grandchildren of our dear friends Hans and the late Lottie Reijzer. Moran has posted part B of the Segoli visit to Madagascar, in Hebrew and in English. We are in London for a week's visit, and return to Israel on Tuesday. We shopped, visited, saw "Macbeth" and enjoyed spending some time with Frankie (see Goldberg Family tree) and Dave who were visiting from USA. Click for a picture of Frankie and Doreen in ChinaTown just before a delicious roast duck lunch. 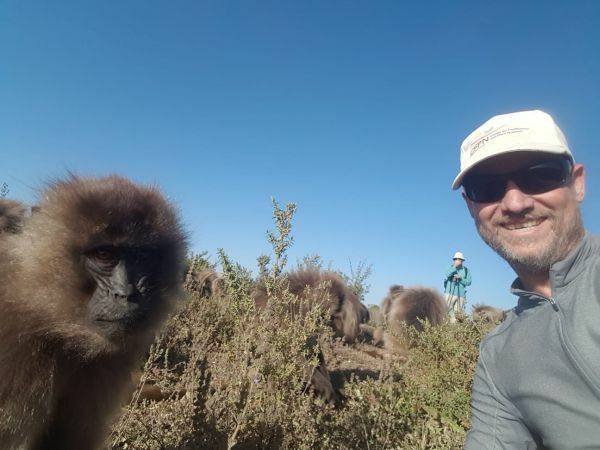 Moran takes a selfie of himself with a gelada monkey. Son Maayan Segoli returned this morning from a six day trek with 2 friends in the Simien Mountains of Ethiopia. He reports a wonderful experience, including seeing the unique Gelada monkey ("bleeding heart monkey") found only in Ethiopia. In 2004 Doreen went on a 4 day trek in the Simien Mountains - you can read her report and pictures here. While Moran was trekking we went to Midreshet Ben Gurion to help with the children. Maayan, for his birthday, wanted to bake a special cake. With a little help from Doreen he baked a delicious 3 layered chocolate and orange birthday cake for himself. See pictures. We were very proud to see a front page picture and a lengthy and positive article in the Yediot Achronot newspaper about our good friend Morris Kahn and his encouragement and financing of Israel's forthcoming launch (next month) of a spaceship that will land on the moon. The article is in Hebrew and can be accessed here. In a few days we are flying to London for a week. We'll meet some old friends, including Frankie Klaff (see Goldberg family tree) and Dave Rothschid who will be visiting at the same time, and see a few plays, and just generally enjoy London.